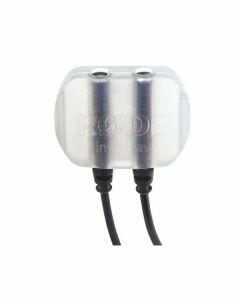 The RØDE invisiLav is designed to aid the concealing of the Lavalier and smartLav microphones. Its soft construction absorbs noise and vibration, while the wide, flat profile provides coverage from the elements and allows for versatile mounting. There's two mounting points in case a redundant mic is required, and cable management on the side. Available in either a pack of three or a bulk pack of ten, the invisiLav comes with pre-cut, skinsafe adhesive that can be used to stick the invisiLav to either the body or to fabric. The invisiLav itself is also made from a medical grade skin safe material so it can be mounted on the body without fear of irritation.